"How do I start a blog?" Over the years, several people have asked me, "How do I start a blog?" I finally get the chance to answer that question formally! 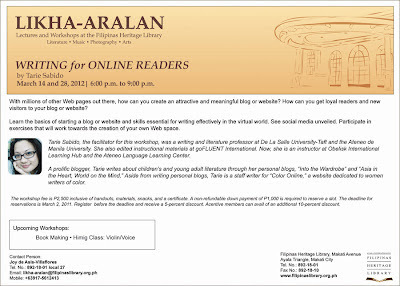 On March 14 and 28 (both Wednesdays), 6-9 p.m. at the Filipinas Heritage Library, I will be teaching a blogging class for beginners. 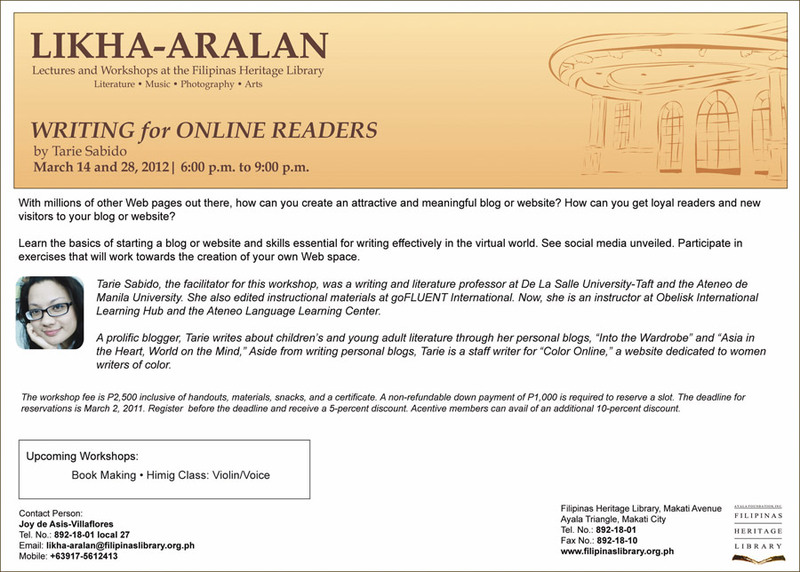 If you have been thinking of starting a blog, but are unsure about how to go about it, this class is for you. If you have *just* started a blog, and have been wondering how to use it to brand your expertise or how to earn real rewards from it, this class is for you. We'll be discussing the hows and whys of blogging and other social media and even workshopping blog posts, tweets, Facebook posts, and other content you create and share using the Internet. For more details, click on the picture above. To register for the class, please contact Joy de Asis-Villaflores at 892-1801, send an SMS to 0917-561-2413, or email likha-aralan@ayalafoundation.org. Thank you so much, and I hope to see you there! I'm really excited about sharing my passion for blogging!